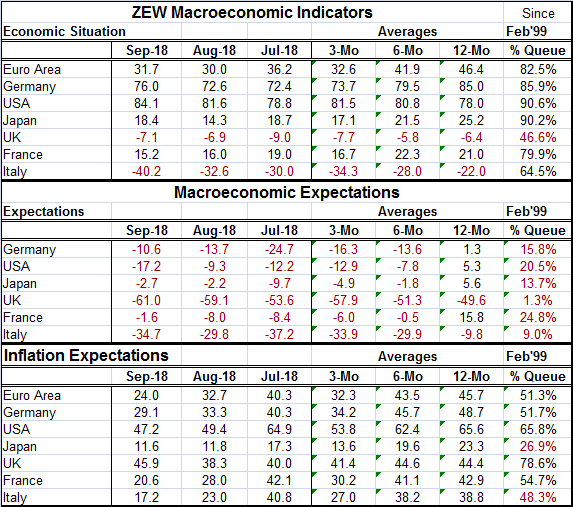 The ZEW financial experts in Germany weigh in each month on their perceptions of the state of the German economy and several other key economies or economic units. In September, ZEW experts see actual conditions as little-changed. Conditions in the euro area, Germany, the U.S. and Japan were slightly improved while conditions in the U.K., France and Italy deteriorated. Current conditions are generally regarded as being in good shape with queue standings in their respective 80th or 90th percentiles for the euro area, Germany, the U.S. and Japan. France has a solid standing just outside this ‘golden range’ at the 79.9 percentile. Italy’s standing is firm in its 64.5 percentile. But the U.K. has a 46.6 percentile standing which resides below its historic median (that occurs at a queue standing value of 50%). However, we put the hearts and roses away when it comes to expectations. Expectations log net negative readings for all regions. Most countries show small changes month-to-month. There are exceptions. The exception is the large deterioration in the U.S. and a significant backsliding in Italy. All countries have an expectation queue standing below its 25th percentile. The U.K. and Italy are each much worse than that. Inflation expectations peaked late in 2016 and have since come down. Over the last two months inflation expectations have fallen further ranging from drops of 6 to 23 points with the U.K. the only countries where expectations for inflation have risen in the last two months. The queue standings have inflation prospects ranked highest in the U.K. with a 78th percentile standing, followed by the U.S. with a 65th percentile standing. Germany, the euro area and France have inflation standings in the 50th decile – pointing to neural expectations. Italy is just below that; Japan’s inflation standing is in its 26th percentile. ZEW experts do not see the BOJ as successful in getting inflation back to its target. Interest rate expectations have not changed much in September. In the U.S. rate hike prospects have a high 88th queue percentile standing; the U.K. has an 82nd percentile standing; and EMU has a 50th percentile standing. Japan is only rated in its 28th percentile. These values are not much different from their 12-month averages either. On balance, growth remains solid. Expectations are deteriorated but have stopped slipping. Inflation expectations largely have diminished. They range from neutral standings to moderate escalation in the U.K. and in the U.S. Short-term rate expectations are very high in the U.S., elevated in the U.K., neutral in the euro area, and low in Japan. While central banks have been flirting with rate hikes, only the U.S. and the U.K. are currently taken seriously. Both already have embarked on path to hike rates. ZEW experts do not see the rake hike club getting bigger soon.